A Page Is Turned: Before...And During. Here we are! T-minus 4 days from moving!!! Can you tell I'm a tiny bit excited? I packed up the boys' toys (well, some of them) this morning and hauled them over to the new house. One load down, one million to go! I'll haul another few loads this week by myself when I have time, Eddie's going to take BIG stuff on Friday - the sofa, the recliner, the washer and dryer, the boys' beds and mattresses, the freezer - and the movers will be there Saturday. Shockingly, I'm not at all stressed, just anxious to get started...hence the hauling by myself today. We went with Porter Paint in Almond Cream on the main living areas (I think...sheesh I tried a million). It looks DARK in the after, but it is the same color as the dining room in the next photo. See ya, RED. Whew. I have never been so happy about a neutral paint color. This room still needs the most work for me. 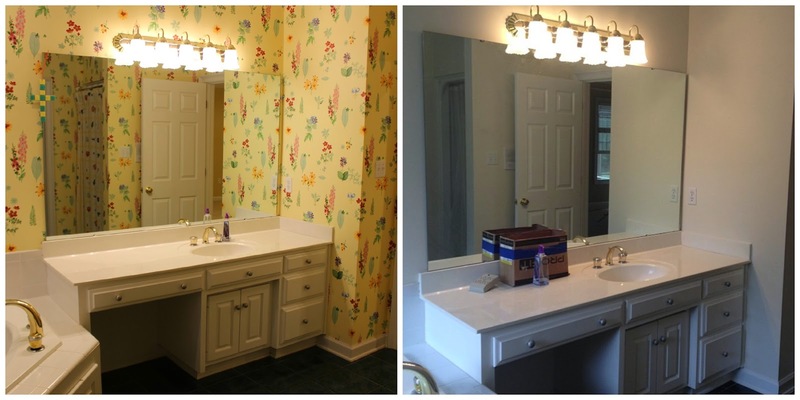 We'll re-do counters, sink, and backsplash in a few years. It's definitely livable. 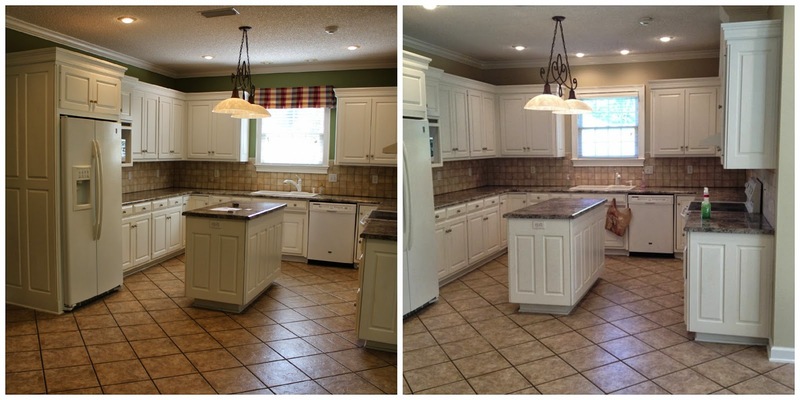 It isn't like the previous kitchen (holy COW....I'll post that below), but it's not my favorite and it looks dated. The paint made a big difference, though! The first paint I picked the painter said, "I like how it picks up the orange/terra-cotta color in the backsplash." And I said, "Well, then that is NOT the paint we'll use." Ha! Whew! 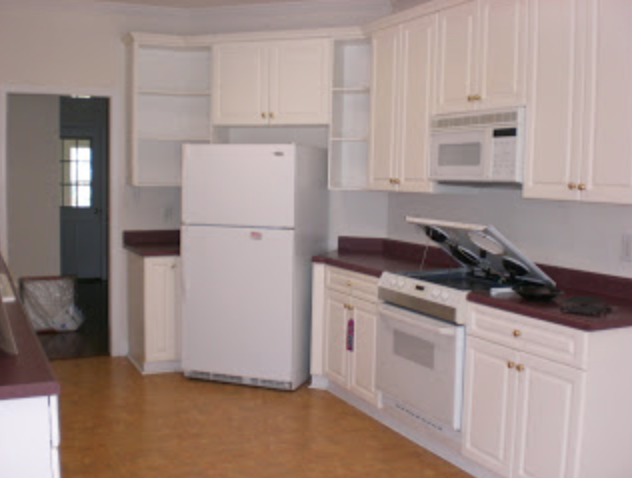 White walls, white cabinets, we rearranged the stove/fridge layout, PURPLE counter tops, YELLOW floor. We've come a long way. See the whole re-do HERE. WOW. That crazy wallpaper gave me a headache. It is PLAIN JANE, but that's ok. 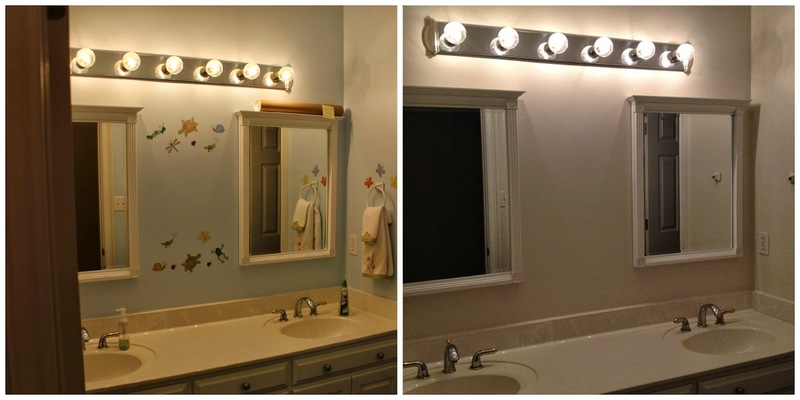 I may change out light fixtures and faucets. There's no color consistency there. Some are nickel, some are chrome, some are both...it just doesn't make any sense. 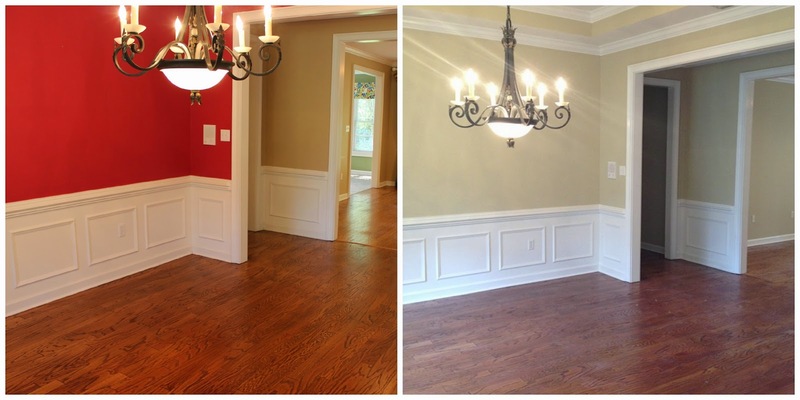 Porter Paint Colonial White. Simple, easy fix here! We took off the stickers on the walls and painted it Colonial White. Easy, peasy! So there you have it! So far, so good! The next few days will bring GREAT things. Can't wait to share them with you! Porter Paint "Almond Cream" (or Almond Paste???) in kitchen, den, dining room, foyer, and halls. 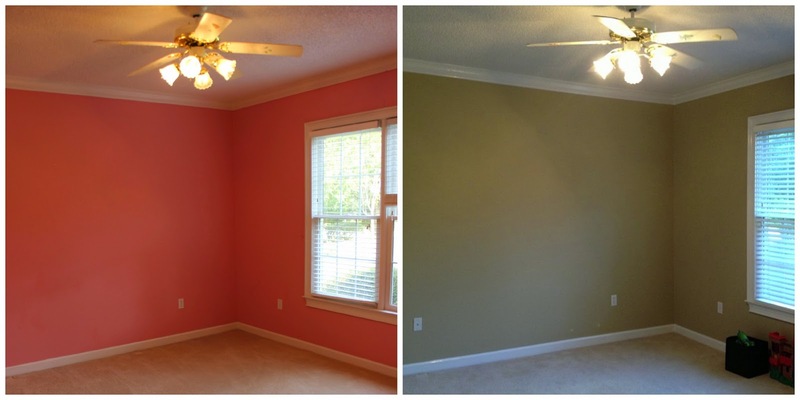 Porter Paint "Real Simple" in master bedroom and boys' bedroom. 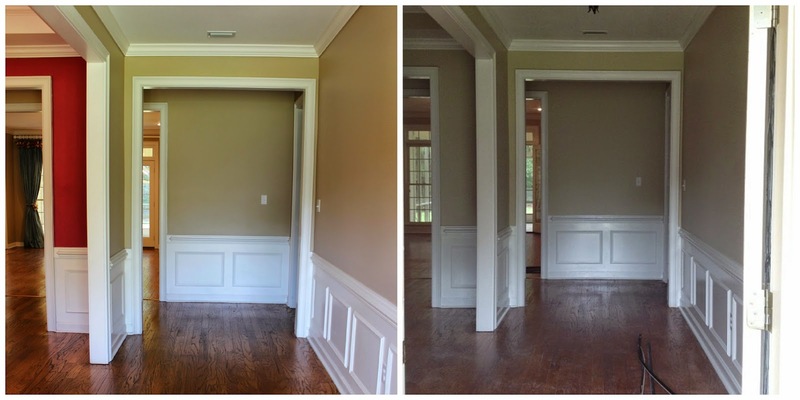 Porter Paint "Colonial White" in all three bathrooms, playroom, and office. Your new house is so beautiful. WOO HOO! Its MOVING week! I love the colors and cant wait to see it all decorated! YAY! BEAUTIFUL, the "lunch bunch" needs a personal tour!